This interesting surname is of English locational from one of the estimated seven to ten thousand villages and hamlets that have now disappeared from maps in Britain. The prime cause of these "disappearances" was the enforced "clearing" and dispersal of the former inhabitants to make way for sheep pastures at the height of the wool trade in the 14th Century. Natural causes such as the Black Death of 1348, also contributed to the lost village phenomenon. The original placename was probably composed of the Old English component "halig", holy (which is also the first element in halifax and Haliwell) and the Anglo-Saxon word "stone" or the Norse "stan", both meaning "stone", hence "holy stone". The place may have been located in Yorkshire, as alot of recordings of the name are found in church records of the county: Sybell, daughter of Alice Helisston was christened at Dewsbury on November 14th 1557. 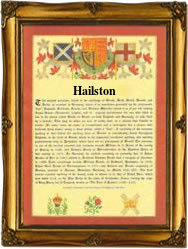 Sarah, daughter of John Hailston was christened Ewell, Surrey on September 10th 1742. John Hailstone (1759-1847), a geologist, was educated at Cambridge while his brother John (1768-1851), was a leading authority on Yorkshire flora. The first recorded spelling of the family name is shown to be that of Johannes de Helistones, which was dated 1379, Yorkshire Poll Tax Records, during the reign of King Richard 11, "Richard of Bordeaux", 1377 - 1399. Surnames became necessary when governments introduced personal taxation. In England this was known as Poll Tax. Throughout the centuries, surnames in every country have continued to "develop" often leading to astonishing variants of the original spelling.